These Mothers Day Recipes are brunch recipes and the time is upon us! Every year Mothers Day is the busiest day of the year at the restaurant. Not even Valentine's Day is as busy! And that tells me, our mothers and grandmothers and yes - the wives in families are highly honored and respected and ...loved. I don't remember where I read this little story but Erma Bombeck, I believe, was the original author. I didn't write it but I really wanted to share it with you. (Thanks Erma). Recipe ideas will follow. The child asked again, "But tell me, here in heaven I don't have to do anything but sing and smile to be happy." God said, "Your angel will defend you even if it means risking her life." Wow! That says it all and reminds me again about how special my mother (my angel) was in my life. So what might you do for your Mom (or yourself and your family) if you don't go to a restaurant on Mothers Day? 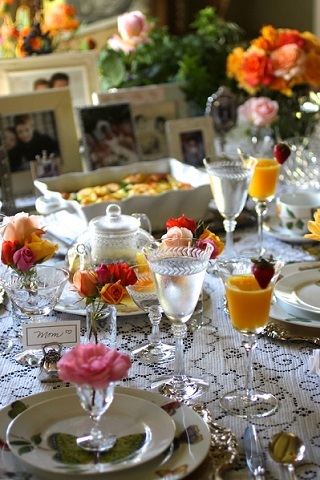 How about a simple Mother's Day Breakfast or Mother's Day Brunch at home? I have some great Mothers Day Recipes for you to try! If you love to cook, like me, it makes sense to do what you love to do, even on Mother's Day. Cooking and entertaining is what I do. That's why I love my work and the website, and I love these Mothers Day Recipes. You will, too. Cooking and entertaining is about love and sharing, so actually Mothers Day is the perfect time to entertain - my husband, my sons and their families and friends. Even on Mother's Day, there's no place like home. 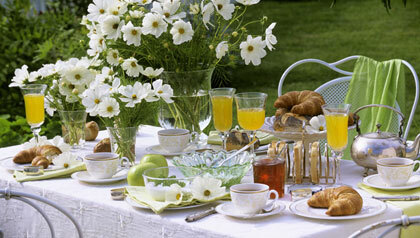 Is anything more decadent and indulgent than a brunch? But one of the "rules" I have for Mothers Day and the menu at home is that the food and drink must be easy to prepare and must be items you can mostly make ahead. That way you can spend time with your loved ones outside of the kitchen. This menu has recipes that comprise a good plan when you're going to feed a crowd. Many of these recipes can be made ahead of time, leaving you to relax and enjoy your company. Depending on the Mothers Day recipes you choose and the size of your crowd, you may need to adjust the amounts of ingredients. Check the suggested Mothers Day Recipes below. If you don't like a particular item just mix and match until you find something that suits your taste (and your Mom's). 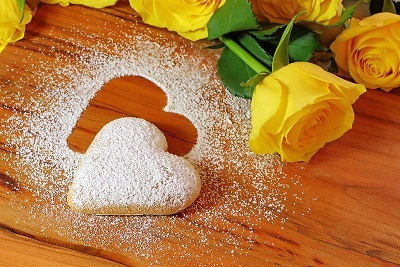 If you'd rather prepare a late afternoon or evening meal, you can also find Mothers Day recipes for Mother's Day Breakfasts, Lunches and Dinners by clicking on Mothers Day Menu or Special Day Menus. 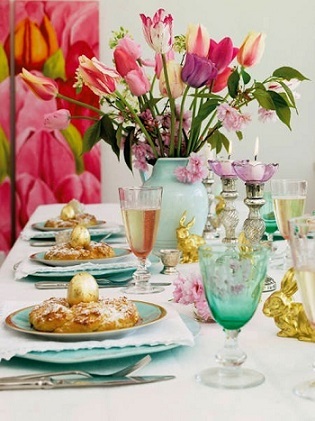 What You Need To Do To Create The Perfect Mother's Day Brunch? Plan your menu ahead and keep it simple. Choose your Mothers Day Recipes from the suggestions below. Once you have selected your Mothers Day Recipes, do your grocery shopping and pick up some flowers for the table and / or other areas in your home. You can make a beautiful center piece with short-stemmed flowers without forcing people to look over or around them to see each other and carry on a conversation. Do you need to buy a nice Mother's Day card? Refrigerate the beverages the night before. Buy sparkling cider and orange juice and / or tomato juice for the kids and for anyone who prefers non-alcoholic drinks or serve them a "Fauxmosa" - Virgin Mimosa (no champagne). Put your Mom's or your own favorite CD on the player. Start with a delicious, but easy, beverage or two. Dazzle your Mom's taste buds, and everyone else who is of age, with a simple (extravagant) glass of champagne, or a Mimosa or a Classic Bloody Mary or how about serving the perfect Mojito!? As an early morning item to accompany your beverage choices, bake off some purchased croissants with lots of butter or try serving some award-winning Bran Muffins or Blueberry Coffee Cake you made the night before or put out a tray of fresh fruit and a few slices of really delicious cheese. Purchase some cooked Bay shrimp (the little shrimp) or some peel and eat shrimp and serve them with a wonderful Cilantro Lime Tartar Sauce and / or some delicious Cocktail Sauce. 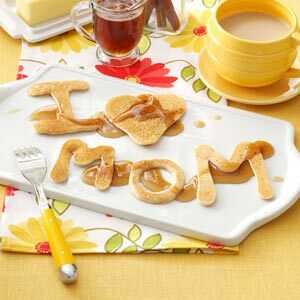 If you decided to make breakfast items on Mothers Day for 4-6 people, I have several Mothers Day Recipes for you that do not take much time but are really delicious. 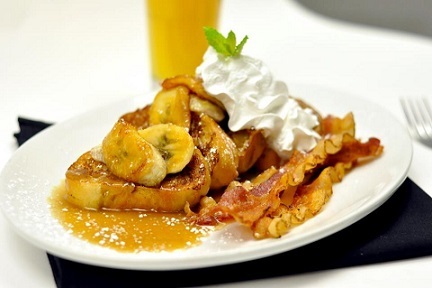 Buttermilk Pancakes or basic French Toast with Warm Caramel Sauce and Maple Syrup. All these Mothers Day Recipes are very good and of course you can add a breakfast meat, and / or fruit slices or a fruit salad if you wish. Crab And Cheddar Cheese Casserole. Extravagantly Delicious! Potato And Cheddar Pie. Simple, But Simply Tasty! Buffet Scrambled Eggs. Everyone's Favorite! Serve To A Group. Cider Glazed Honey Baked Ham. For this item, you use a precooked ham and put it in your oven an hour and fifteen minutes before you want to serve it. The recipe is easy and delicious. And if you have an extra 15 minutes, make your own creamy mustard sauce to accompany your baked ham. It is a fabulous recipe. Just click on Mustard Sauce and enjoy! Scramble some eggs to go with the ham and make some oven-roasted red potatoes, and toasted bread you purchased from the bakery the day before (or you can serve those award-winning Bran Muffins or Blueberry Coffee Cake if you didn't use them on an early morning tray). What about serving a tasty Spinach And Strawberry Salad? or, if you'd prefer, a Grape Salad? Oh! Desserts! I have many dessert recipes on the website from which to choose, but here are a couple you probably haven't seen before now. Try serving a secret restaurant recipe for Lime Delight! or Apricot Bars. Enjoy your Mothers Day Recipes and the company of those you share them with!